(Nanowerk News) Imagine being able to drop a toothpick on the head of one particular person standing among 100,000 people in a stadium. It sounds impossible, yet this degree of precision at the cellular level has been demonstrated by researchers affiliated with the Johns Hopkins University Institute for NanoBioTechnology. Their study was published online in June in Nature Nanotechnology. The team used precise electrical fields as "tweezers" to guide and place gold nanowires, each about one-two hundredth the size of a cell, on predetermined spots, each on a single cell. Molecules coating the surfaces of the nanowires then triggered a biochemical cascade of actions only in the cell where the wire touched, without affecting other cells nearby. The researchers say this technique could lead to better ways of studying individual cells or even cell parts, and eventually could produce novel methods of delivering medication. Indeed, the techniques not relying on this new nanowire-based technology either are not very precise, leading to stimulation of multiple cells, or require complex biochemical alterations of the cells. "One of the biggest challenges in cell biology is the ability to manipulate the cell environment in as precise a way as possible," said principal investigator Andre Levchenko, an associate professor of biomedical engineering in Johns Hopkins' Whiting School of Engineering. In previous studies, Levchenko has used lab-on-a-chip or microfluidic devices to manipulate cell behavior. But, he said, lab-on-a-chip methods are not as precise as researchers would like them to be. "In microfluidic chips, if you alter the cell environment, it affects all the cells at the same time," he said. Such is not the case with the gold nanowires, which are metallic cylinders a few hundred nanometers or smaller in diameter. Just as the unsuspecting sports spectator would feel only a light touch from a toothpick being dropped on the head, the cell reacts only to the molecules released from the nanowire in one very precise place where the wire touches the cell's surface. 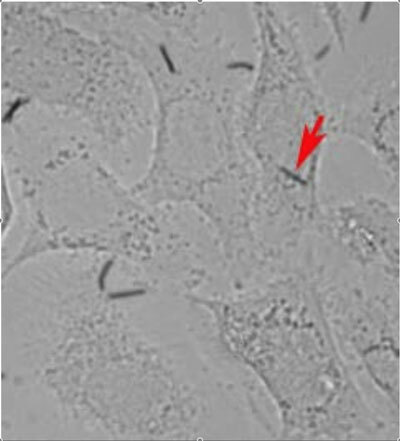 With contributions from Chia-Ling Chien, a professor of physics and astronomy in the Krieger School of Arts and Sciences, and Robert Cammarata, a professor of materials science and engineering in the Whiting School, the team developed nanowires coated with a molecule called tumor necrosis factor-alpha (TNF-alpha), a substance released by pathogen-gobbling macrophages, commonly called white blood cells. Under certain cellular conditions, the presence of TNF-alpha triggers cells to switch on genes that help fight infection, but TNF-alpha also is capable of blocking tumor growth and halting viral replication. Exposure to too much TNF-alpha, however, causes an organism to go into a potentially lethal state called septic shock, Levchenko said. Fortunately, TNF-alpha stays put once it is released from the wire to the cell surface, and because the effect of TNF-alpha is localized, the tiny bit delivered by the wire is enough to trigger the desired cellular response. Much the same thing happens when TNF-alpha is excreted by a white blood cell. Additionally, the coating of TNF-alpha gives the nanowire a negative charge, making the wire easier to maneuver via the two perpendicular electrical fields of the "tweezer" device, a technique developed by Donglei Fan as part of her Johns Hopkins doctoral research in materials science and engineering. "The electric tweezers were initially developed to assemble, transport and rotate nanowires in solution," Cammarata said. "Donglei then showed how to use the tweezers to produce patterned nanowire arrays as well as construct nanomotors and nano-oscillators. This new work with Dr. Levchenko's group demonstrates just how extremely versatile a technique it is." To test the system, the team cultured cervical cancer cells in a dish. Then, using electrical fields perpendicular to one another, they were able to zap the nanowires into a pre-set spot and plop them down in a precise location. "In this way, we can predetermine the path that the wires will travel and deliver a molecular payload to a single cell among many, and even to a specific part of the cell," Levchenko said. The team members envision many possibilities for this method of subcellular molecule delivery. "For example, there are many other ways to trigger the release of the molecule from the wires: photo release, chemical release, temperature release. Furthermore, one could attach many molecules to the nanowires at the same time," Levchenko said. He added that the nanowires can be made much smaller, but said that for this study the wires were made large enough to see with optical microscopy. Ultimately, Levchenko sees the nanowires becoming a useful tool for basic research. Levchenko said, "If the wires retain their negative charge, electrical fields could be used to manipulate and maneuver their position in the living tissue."